Two races into the 2011 IZOD INDYCAR Series oval campaign. Alex Tagliani and the #77 Sam Schmidt Racing car is currently undefeated in qualifying. Blazing along the 1.5 mile Texas Motor Speedway in 48.6834 seconds in the two-lap qualifying run, Tagliani claimed pole for race 1 of a revived open wheel racing scenario called the twin-race. The event is called the Firestone Twin 275s and consists of two individual races run on the same Saturday night at Texas. Tagliani was just short of nine one-hundreds of a second faster than Target/Chip Ganassi Racing's Dario Franchitti. The performance in time trials came within a week where the driver and team made quite a bit of news off-track. First, there was the departure of team engineer Allen McDonald who has defected to Andretti Autosport. Essentially a homecoming for McDonald, he is now working with Mike Conway #27 race car. For the Texas event, Tagliani's car will be tuned by Todd Malloy who had just worked two weeks ago on the car that brought Dan Wheldon to the 2011 Indy 500 winner's circle. Apart from the race engineer story, rumours suggested the Sam Schmidt Racing was considering the release of the French-Canadian Indy 500 pole sitter. Clearly by the fact that Alex Tagliani is still with the team at Texas Motor Speedway, those rumours seem undeveloped ,for the moment. There have been no official comments about those speculations by either Tagliani or Sam Schmidt Racing. Recording an average speed of 215.186 miles per hour in the qualifying run, Alex Tagliani felt confident before he was even seated in the #77 Sam Schmidt Racing car. "I told Will (Power) I was coming for him." Tagliani joked. Referring to the pole run, Tagliani continued "It's a tribute to how much effort and how much love the guys put in the car. I watched them work the last two weeks and they worked harder than when they brought the car to Indianapolis." The qualifying results established on track Friday afternoon will only apply to the first race of the Firestone Twin 275s. For the second race, the drivers will be lined up by result of a special draw. 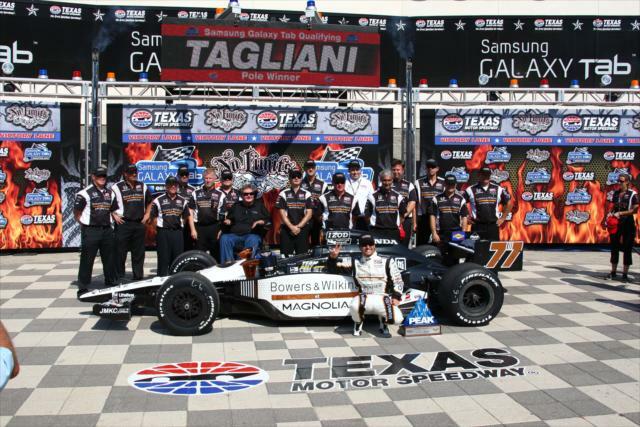 A Texas Motor Speedway record for the IZOD INDYCAR Series, a total of 30 drivers will compete in the double race Saturday night including the additions of Paul Tracy and Sebastian Saavedra. Long time Firestone Indy Lights driver Wade Cunningham will be starting his first IZOD INDYCAR race. The Firestone Twin 275s starts at 8pm on Saturday night. At the end of the first race, there will be a one hour intermission for the second race at Texas Motor Speedway.